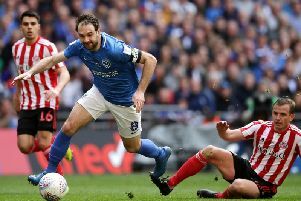 Sunderland boss Jack Ross faces three tough choices ahead of the Checkatrade Trophy final at Wembley against Portsmouth this Sunday. Ross has more or less a full squad, with only wingers Duncan Watmore (ankle) and Chris Maguire (broken leg) definitely out. But that sets up at least a trio of key selection questions as the Black Cats prepare for their big day out. Who will get the nod? We dig deep into the evidence of the season so far for clues. Having joined in January, Morgan scored his first – and only – goal for Sunderland in the Checkatrade semi-final against Bristol Rovers at the Memorial Stadium. But Morgan has played 10 games in all competitions during his first three months on Wearside, and was also a favourite of Ross when the pair were at St Mirren in the 2017-18 season. Gooch, an SAFC academy product, has been a regular feature in Ross’s side since the start of the season, and produced six goals and seven assists in all competitions. But the fact that the American has come on for Morgan in several recent matches, including the league win against Walsall and the semi-final at Bristol Rovers possibly hints at a place on the bench at Wembley. With Tom Flanagan nailed on to start, Dunne and Baldwin fight for the other centre-back spot. Since joining in January, Dunne has generally been favoured by Ross, but Baldwin has started Sunderland’s last two league games. It’s a tight call, but Dunne may just edge it, based on his performance against Bristol Rovers in the semi-final. Possibly the biggest dilemma for Ross is at left-back. Although not a specialist left-back, Matthews has shown he can do a job on his weaker side, contributing to solid defensive performances against Barnsley and Walsall recently, and also creating seven goals in all competitions this season. Want-away Oviedo has swallowed his frustration at failing to secure a move away last summer by showing his superior ability at times this season, and would be a logical choice if Ross wants Sunderland to go in all guns blazing on Sunday. But with Oviedo having not played since January, Reece James is a more realistic rival for Matthews. The Wigan old boy has made the most appearances out of the three since joining Sunderland last summer, and his link-up play with top scorer Aiden McGeady has been a joy at times. But Matthews’ impressive assists record may see him start at Wembley.